Over the years, while love of baseball has only grown, my appreciation of it has evolved. I've gained a new respect for various aspects of the game that I overlooked growing up. It used to be the flashy skills that I caught my eye, but these days I've grown to love the subtleties. One of the subtle aspects I've come to appreciate is an effective approach at the plate. The game of baseball is largely decided by the battle between the pitcher and hitter over the strikezone, so the importance of utilizing a good approach at the plate truly cannot be understated. The reason for its importance is remarkably simple. Hitters perform better in hitter's counts, while pitchers thrive in pitcher's counts. Accordingly, any time the hitter can win the battle over the strikezone by working his way into a hitter's count, his chances for success increase. That's why I love "late count" hitters, because they are constantly battling to put themselves in counts that are in their advantage. They understand the importance of forcing a consequence to the plate appearance on their own terms, not those of the pitcher. To illustrate, here is a breakdown of the total offensive performance of the 2007 Reds broken down by count. The counts highlighted in red are the pitcher's counts. The counts highlighted in green are the hitter's counts. The other counts are the neutral counts. The difference in performance is striking. If the hitter falls behind and ends up in a pitcher's count, then the likelihood of offensive success falls drastically. On the other hand, if the hitter can work his way into a hitter's count, then the likelihood of success improves dramatically. It really does make a difference, so acquiring hitters who understand the nuances of a good approach at the plate would seem to be a wise strategy. Now, if you take a look at the primary offensive players for the Reds in 2007, you can see who utilizes a "late count" approach to work their way into hitter's counts. The availability of pitch data allows us to examine the approach of batters at the plate. The following spreadsheet is sorted by "Total Hitter's Count %", which is the percentage of counts that a hitter sees that are hitter's counts (3-0, 2-0, 3-1). Obviously, each pitch thrown results in a different count. So, if you look at the number of hitter's counts seen and divide it by the number of pitches seen, then you get a quick and dirty look at which hitters excel at putting themselves in the best position to succeed. 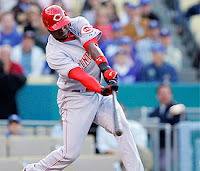 In 2007, 7.8% of the counts seen by the Reds as a team were hitter's counts. Not surprisingly, Scott Hatteberg tops the list. His approach at the plate is really one of the very best in baseball. He consistently works the count into his favor, which increases his chances of success. He's patient and disciplined, refusing to give in to the pitcher by forcing a conclusion to the At Bat on the pitcher's terms. In 2007, Hatteberg was in a hitter's count a remarkable 12.1% of the time. Another standout is Ken Griffey Jr. (10.3%) and Adam Dunn (8.5%) doesn't fare too poorly either. Of course, these numbers are still a bit rough, because there is no simple way to exclude intentional walks or unintentional walks. Griffey benefited a bit under this analysis from his a bit from his 14 IBBs and I suspect David Ross benefited a bit from the unintentional walks frequently given out to 8th place hitters. That said, these factors certainly aren't going to sway the analysis enough to rob it of its merit, as it still provides a very good look at the approach utilized by each hitter. At the other end of the spectrum, you have Brandon Phillips and Norris Hopper. Of all the counts seen by Phillips, only 4.4% of them were hitter's counts. As for Hopper, only 4.5% of the counts he saw in 2007 were hitter's counts. Of course, there are many ways for a hitter to be successful, but looking at this its difficult for me not to have a strong preference for "late count" hitters. Brandon Phillips had remarkable success in 2007 without working his way into many hitter's counts, so the approach at the plate is clearly a secondary consideration to the production the hitter creates. Phillips is able to succeed on his raw ability alone, regardless of the count in which he hits. However, time will tell whether he'll be able to maintain his level of success given his free swinging approach. Hitters can be successful using any approach at the plate, but the "late count" approach definitely has its advantages. 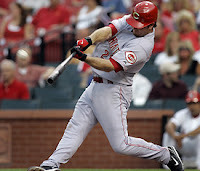 Ideally, the Reds will be able to find more hitters that utilize this approach. In the meantime, let's enjoy Scott Hatteberg while we can.